Jabal Maqla means “The Burned Mountain.” Its name reflects the distinctness of the mountain’s blackened peak. Its name may also be influenced by the local tradition that it is “Jabal Musa” (the Mountain of Moses) or Mount Sinai, where the Abrahamic religions’ holy books say God descended as a fire and delivered the 10 Commandments to Moses. He ascended up to Mount Sinai, which is the highest of all the mountains that are in that country and is not only very difficult to be ascended by men, on account of its vast altitude, but because of the sharpness of its precipices also; nay, indeed, it cannot be looked at without pain of the eyes: and besides this, it was terrible and inaccessible, on account of the rumor that passed about, that God dwelt there. Josephus did not specify that the top of the mountain was blackened, nor does any other ancient historical source that we are aware of as of the time of this writing. Though he did specify that ascending the mountain was difficult because of its terrain. Joel Richardson, who recently traveled to Jabal Maqla in Saudi Arabia as well, believes that this mountain fits Josephus’ description. Anyone who has been to this mountain, and particularly anyone who has attempted to climb it, can attest that Josephus’s description seems to be quite accurate. While parts of Jebel al-Makklah are smoother and less rugged than other mountains, as a whole it is a very challenging mountain to climb. Much of the mountain, particularly on the lower portions is comprised of large boulders. As far as I know, there is no path anywhere. What you cannot see unless you’ve been there, is that tucked in between so many of the boulders are all kinds of desert plants, briers, and thorns. If you attempt to climb the mountain without good boots and gloves, you are likely to regret it. Joel Richardson, Mount Sinai in Saudi Arabia: The True Location Revealed, WinePress Media, 2019, 100. The Doubting Thomas Research Foundation team traveled to Jabal Maqla several times over a period of two years and agrees with Richardson’s assessment of the terrain. St. Catherine’s mountain in Egypt’s Sinai Peninsula has steeper slopes than Jabal Maqla, but based upon on-the-ground observation of Jabal Maqla’s slopes, we believe it is still certainly viable. What About this blackened peak? The color of Jabal Maqla’s top is so distinct that the British explorer John Philby made a point of mentioning “the basalt pyramid of Maqla” when he traveled through the area. Basalt is a dark, igneous rock formed from volcanic activity. The darkest spot is at the top of Jabal Maqla, which is within a broader black streak that is a bit less dark. The less darkened portion is below the top and continues along the ridges, extending about a half-mile to the northwest to another peak. The darkened rock also encircles the plain that is in front of the mountain, giving it an appearance that is similar to an arena. The rest of the mountain is brown and grey. Mount Sinai was covered with smoke, because the Lord descended on it in fire. The smoke billowed up from it like smoke from a furnace, and the whole mountain trembled violently. The appearance of Jabal Maqla’s darkened top is visually stunning when it is viewed with the Exodus story in mind. There is disagreement among proponents of the mountain being Mount Sinai over whether this appearance is evidence of the phenomenon described in Exodus when God is said to have descended upon the mountain. The rocks at the top of the mountain are only black on the outside. The inside is a different color, making it tempting for believers in the Exodus story to envision the rocks as having been burnt. Bob Cornuke, the President of the BASE Institute, climbed the mountain in the 1980s and described the rocks at the top as completely black and looking slick like glass. When broken, the inside of the rocks shows a reddish-tan layer and a brown core that matches the rocks found on the rest of the mountain. It indicates that the rocks had a chemical interaction that only altered the outside and only occurred at the top of the peak. The blackened peak of Jabal Maqla. Dr. Charles Whittaker interviewed multiple scientists for his 2002 thesis about the blackened peak at Mount Sinai. There were differences in the analyses because the scientists could not have access to the mountain directly and so they were unable to determine how representative the rock samples are of the entire peak or particular sections of the peak. Tests on samples of the blackened rock retrieved in the 1980s by Bob Cornuke indicate they are metamorphic basalt. If Mount Sinai’s blackened peak is composed of basalt, then it can be argued that the darkened top is a natural “roof pendant” that is formed when metamorphic rock protrudes through younger rock and forms a layer on top. The result is a dark top with a distinct line where the color becomes lighter. Another geologist interviewed by Dr. Charles Whittaker provided a different analysis. He said that the darkened rock is one of two types of granite at Mount Sinai’s blackened peak. Most of the granite is of the kind that exists throughout the entire upper region of the mountain. It is not limited only to the top. It is granite that turned into “greenstone;” a smooth and rock with a dark blue-black-grey look. “It is absolutely granite, of the exact same variety of the entire rest of the mountains in the area. It appears reddish-pinkish-brown on all the surrounding mountains. The difference in this peak’s dispersion of this rock is that it has been darkened. By what, I don’t know. The geologist would not attribute the difference in the granite to heat because granite rock that is exposed to intense heat and undergoes metamorphosis does not become shiny black. However, he could not say what caused only some of the granite to darken. The granite rock would only become shiny black if it has changed into obsidian, volcanic glass formed when lava covers an igneous rock and cools rapidly. If the phenomenon described in the Exodus account happened, we obviously do not know its chemical makeup and therefore cannot say whether its effects on the rock would replicate or resemble the process that creates obsidian. 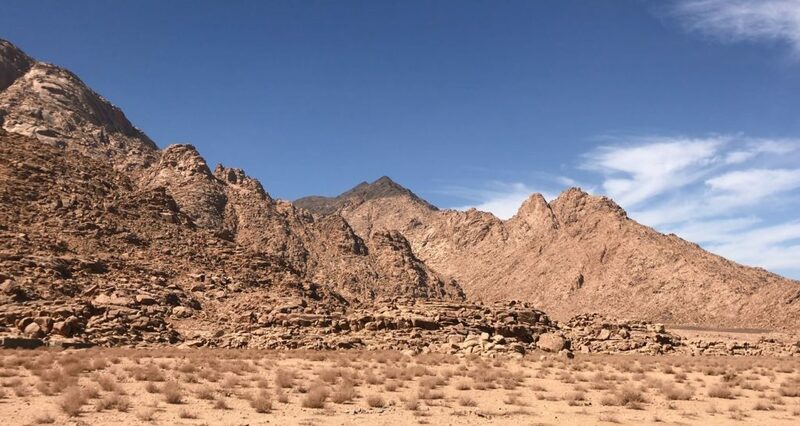 Dr. Glen Fritz, who holds a Ph.D. in Environmental Geography and wrote a book about this issue, believes that Jabal Maqla is the best candidate for Mount Sinai but dismisses the significance of the blackened peak as being a purely natural creation. According to Dr. Fritz, the rocks are darkened because they are ancient Precambrian volcanic basalt and the lighter rock below it is granite. He writes that the change in color is due to the iron oxide inside the basalt and not because of any non-natural phenomenon. The rocks cannot be scorched because granite and basalt do not have the carbon necessary for combustion. Geologist Dr. John Morris agrees that the darkened rocks in the Jabal al-Lawz range, including Jabal Maqla, are normal metamorphic rock. He says the rocks are typical for northwestern Saudi Arabia because there are multiple volcanoes. A critic would point out that the Al-Harrah basaltic volcanic field that he refers to is several hundred miles to the northeast of Jabal Maqla. Dr. Morris says the peak is missing the evidence of burning that one would expect to be found, such as plants being melted into the rock (although they may be vaporized in such a scenario). Three university professors interviewed by Dr. Charles Whittaker for his doctoral thesis about the search for Mount Sinai agreed with that analysis. However, one cannot rule out the possibility that future excavation or scientific advances may detect signs of a phenomenon resembling the one described in the Exodus account. Dr. Charles Whittaker has presented several theories as to how such a phenomenon may have occurred without contradicting the scientific analysis. There have been multiple speculative theories that may reconcile the Biblical account with the scientific data. Whittaker theorizes that the fiery phenomenon may have consumed the granite rocks at the top of the peak, resulting in the black basalt dike protruding through the granite to the top as seen today. In such a scenario, the intense heat would turn the granite into a molten substance and then consume it. The granite would act as a buffer to the basalt, slowing its metamorphosis in a process known as thermal gradient. If the heat source suddenly disappeared as the Biblical account suggests, the unconsumed granite would cool rapidly and could create the obsidian rind seen today. As mentioned before, obsidian is created when an igneous rock is impacted by extreme heat and then rapidly cools. One professor interviewed by Whittaker was surprised by the granite. He said that it is uncommon for the granite to metamorphosize into having a black and shiny exterior like cultured glass, but to still have the pinkish granite on the inside. However, obsidian has a glassy texture. Mount Sinai’s blackened peak has rocks that are shinier and smoother than the other rocks, but the texture is not glassy as obsidian should be. The difficulty in testing the theory is that it is not known how much granite was originally above the basalt dike, so it cannot be determined whether granite has disappeared and if so, how much or what the cause was. It’s also been speculated that the natural chemical weathering process seen in the rocks was sped up by the phenomenon. According to this idea, the extreme heat source could have consumed some of the granite as described above. The remaining, lighter-colored granite would be weakened by the episode and become more susceptible to the chemical weathering that naturally occurs over the years. This could theoretically account for the mixture of greenstone and granite and the fragility of the granite that makes it so breakable. One professor interviewed by Dr. Whittaker suggested that the dark rind is not obsidian and is a feature that can be created by natural chemical weathering of granite. The problem with that suggestion is that it does not explain why the inevitable weathering process would only impact that peak and not the entire area experiencing the same conditions. Whittaker suggests that the Biblical phenomenon may have impacted the peak, therefore altering its weathering process. It is sometimes suggested that the Biblical phenomenon could be responsible for the metamorphic process seen in the rocks. Metamorphic rock is created when igneous rock is affected by extreme heat and pressure and then fuses with other types of minerals. The problem with the theory is that the light-colored greenstone granite is not the “parent” rock of the metamorphic black rock. In other words, the lighter rock was not metamorphosized into the dark rock that is in question. Does Mount Sinai Have to Have a Blackened Top? This discussion raises the question of whether the real Mount Sinai even necessarily needs to have a blackened peak, or evidence of the fiery Biblical phenomenon described in Exodus. The strongest argument that there shouldn’t be evidence of flame is that other supernatural fires described in the Bible don’t necessarily burn anything. The clearest example is that of the Burning Bush, where the book of Exodus says that God spoke to Moses through a bush near Mount Sinai that appeared to be on fire but was not consumed by the flame. Another example is the “pillar of fire” that guided the Israelites out of Egypt, blocked the Pharoah’s army from reaching the Israelites at the beach before the Red Sea Crossing and continued to guide them to Mount Sinai. The account gives no indication that the pillar left behind smaller flames, burnt the ground or created smoke that could have inhibited the Israelites’ travel. Those who favor this camp can also point to some translations of the book of Exodus that say God descended upon the mountain “like a fire,” referring to the smoke and visual effects of the phenomenon. They can also point to the fact that Moses was able to get close to the fire and talk to God, something that is difficult to explain if it was a literal fire with intense heat and smoke. A very literal reading of the text favors the existence of an intense flame, as Exodus 19:18 describes a massive smoke ascending upwards from the mountain as a result of the flame. Deuteronomy 4:11 more directly describes a high-reaching fire, saying “the mountain burned with fire, to the very heart of heavens.” A fire of this magnitude certainly could lead to some sort of metamorphosis in the rocks, leading to Mount Sinai’s blackened peak. Although the Biblical record describes nonliteral fires, there are supernatural occurrences with literal fires described. For example, 1 Kings 18:38 details how God manifested a literal fire on Mount Carmel to assist the Prophet Elijah that even consumed the altar stones. A Brief Fire Leaving Minimal Evidence? Whittaker points out that we may be overestimating the amount of evidence that the fiery phenomenon would leave behind. This is especially true if it was a literal fire that had supernatural or uncommon characteristics along with it. Exodus 20:18 indicates that God came down onto Mount Sinai as a fire and invited Moses up to speak with him on the third day at the mountain. The other interactions do not explicitly describe a literal fire. It is possible that the literal fire happened only once and it may have been for a relatively brief period of time. At this point, we don’t know for certain what caused Mount Sinai’s blackened peak. There are multiple competing theories, each with points of merit. However, until samples of the rock can be taken and tested in a lab, we will have to accept that there are multiple possibilities. Looking at the Google maps satellite image, to the east of Jabal Maqla in the gorge (just beyond the blackened perimeter) there is another blackened feature that is shaped like a claw. Could it perhaps be some kind splatter created by a fireball (or something like it) which rolled off the mountain and struck the other side of the gorge? Fascinating. Maybe! We’re not exactly sure how far God’s presence would have extended from the top of the mountain. It could have been over several peaks, with Jabal Maqla/Mount Sinai being the epicenter where Moses spoke with God, roughly speaking.